Seller – How do I get started? Home / Selling that house! / Seller – How do I get started? Please contact us when you want to start – we’ll help you! Pricing and break-even analysis; there are many components to consider but we’re here to help make the complex simple! Residential Listing Agreement – before we can adequately represent your interests and assist you to sell your home it will be important for you to understand and sign a Residential Listing Agreement. This document specifies the condition by-which your house will be listed (and sold!) – pricing, showing services & access, commissions, etc., etc. We’ll help you understand the implications of this 8-page contract. RE paper work – we’ll need to validate Title, Survey, Warranties, Seller’s Disclosure, etc. These will be required for finalizing and closing the deal. Marketing strategy – there are multiple means to market and show your house; we’ll utilize all pertinent options for your home. Marketing Syndications – 60+ including Realtor.com; Craigslist; Front Door; etc. Surveys and other means to capture Buyer interest and feedback. Also see Marketing that makes a difference! and SOLD! Offers, Negotiations, & Closing – We’ll negotiate on your behalf, keeping your interests foremost. We’ll help you to get the best deal while balancing the risk of losing the deal due to conflicting interests (with the Buyer). We’ll help you to understand the contracts and various forms required to navigate the real estate process. Break Even Analysis – We’ll help you to understand prior to making an offer and through negotiations the break-even/profit-loss implications. It’s a complex business but we’re here to help make it a great experience! Move-out & the future –give us the chance to find the next home of your dreams! 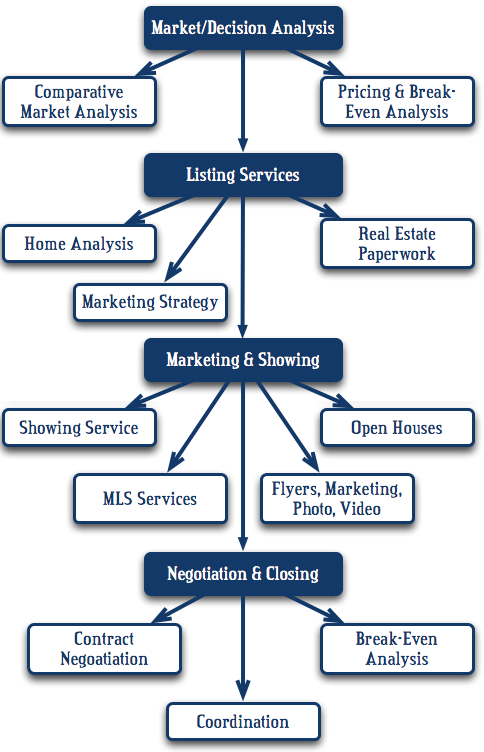 See Buyer Services and Buyer – How do I get started? Let’s Get Started! Want to know what your home is worth?